Great breakfast recipes will keep your figure slim and trim, help you feel full and satisfied all morning long, and make your mouth water. Try changing up your morning routine with some of these delicious and nutritious options. This heart-healthy breakfast recipe will keep you going strong until lunch. Who knew a nutritious breakfast recipe could taste (and look) so delicious? It's packed with protein and vegetables, making it a perfect addition to any healthy weight management menu. Heat the asparagus and green bell pepper over medium heat with the olive oil until the vegetables starting turning soft (about 3 minutes). Stir in the basil, oregano and garlic, and continue cooking another 3 to 5 minutes. Remove the vegetables from the pan and set them aside. Beat the eggs with milk in a small bowl. Melt 1/2 tablespoon of butter in skillet over medium heat. Pour half of the milk and egg mixture into the pan with the butter. Sprinkle the egg mixture with the diced peppers. Cook until the egg mixture is set. Sprinkle the omelet with salt. 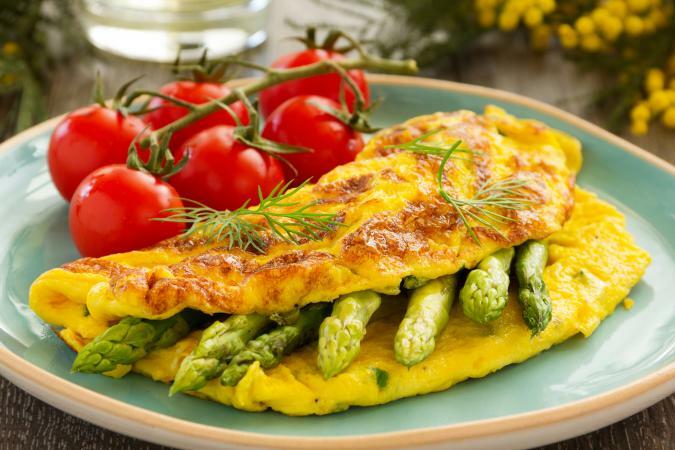 Place 7 asparagus halves and 1/4 cup of feta cheese on top of the omelet. Press the edges together lightly, and cook 1 to 2 minutes longer. Repeat with the remaining butter, egg mixture, vegetables, and feta to form a second omelet. Cut each omelet in half (if desired) and serve. This is a tasty option for a healthy, light and refreshing breakfast that helps you stay slim and trim. Greek yogurt parfait is the perfect sweet (but nutritious) breakfast treat and loaded with protein, calcium, fiber, vitamins, and minerals. Place 1 cup of Greek yogurt into a small glass serving dish. Top the yogurt with 1/4 cup of strawberries and 1/4 cup of kiwi fruit. 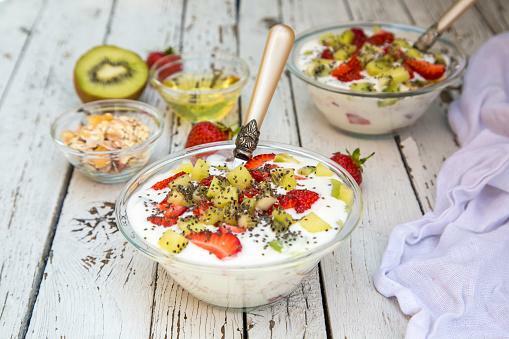 Sprinkle 1 teaspoon of chia seeds on top of the yogurt and fruit. Add ¼ cup of rolled oats, if desired. Top with the agave syrup (this step is optional). Repeat with remaining ingredients to make a second dish of yogurt parfait. Without the agave, nutrition information follows. With the agave, add 63 calories and 15 grams of carbs per tablespoon. When you're on the go or simply need some extra protein to get your morning started off right, try an almond blast protein shake. It's packed with protein, heart-healthy fat, and fiber. Ingredients include protein powder, milk, oats, raisins, almonds, and peanut butter. This nutritious protein-packed smoothie is gluten-free and also works well as pre- or post-workout nourishment. Craving muffins but want a healthier version of a muffin recipe you can eat guilt-free? Try apple bran muffins, which contain non-fat yogurt, apples, applesauce, egg whites (instead of whole eggs), oat bran, whole-wheat flour, baking powder, cinnamon, and nutmeg. Brown sugar is also included as an ingredient for sweet flavor, but you can substitute low-calorie artificial sweetener for 1/2 of the brown sugar the recipe calls for. This recipe is sure to be a hit with kids and adults alike as it's tasty, nutritious, and provides a quick boost of energy to wake you up in the morning. It's rich in protein, fiber, and healthy fats --containing rolled oats, almond butter, dates, chia seeds, flax meal, and dried cranberries as ingredients. If you're following a healthy vegan diet, this vegan breakfast smoothie recipe won't disappoint. It's loaded with protein and fiber and packed with flavor. Simply combine soy milk, frozen bananas, wheat germ, and vanilla; blend until smooth; and enjoy! Eating healthy gets your morning started off right, helps you maintain a healthy weight, provides you with a quick boost of energy, and keeps you feeling full and satisfied all morning long. If you're short on time when you wake up in the morning, be comforted knowing many of the healthy breakfast recipes above can be prepared the night before.